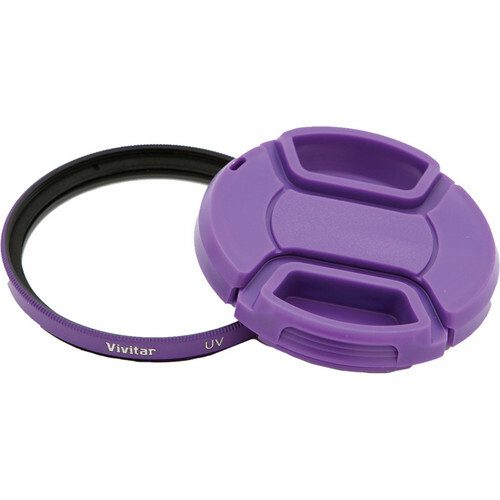 The Vivitar 55mm UV Filter and Snap-On Lens Cap is a color-coordinated kit that includes both a UV filter and snap-on style lens cap to offer general protection to the front of your lens from dust, dirt, moisture, and other elements. The UV filter is a general use, clear filter that helps to absorb ultraviolet light and reduce the bluish cast of daylight. No additional coloration or contrast is provided, allowing you to pair this filter with others. It also serves well as an additional layer of protection to your camera lens in case of accidental drops or in situations where scratching could occur. The snap-on lens cap is compatible with lenses and filters featuring 55mm female threads and provides a convenient layer of protection to the optical surface from a variety of elements. Its snap-on design allows for quick and easy removal and installation. Box Dimensions (LxWxH) 4.7 x 3.6 x 0.7"
55mm UV Filter and Snap-On Lens Cap (Purple) is rated 5.0 out of 5 by 1. Rated 5 out of 5 by Trisha from Love it!! Love the color because now I can tell lens apart from one another....Its wonderful! !